Afelia is a traditional Cypriot dish of small pieces of fried pork meat cooked in red dry wine and coriander. It is usually accompanied by bulgur pilaf or “patates antinachtes“. The origin of the word “afelia” comes from ancient Greek and they were called ovelia = avelia. The word ovelias means cooked meat (usually lamb) on the spit. My mother used to cook this dish for us quite often. I spiced it up a bit, giving my own twist to this dish, adding some mushrooms as well. My mother would also add potatoes, but sometimes when she didn’t, she would accompany it with a bulgur wheat pilaf. My children prefer it with potatoes so most of the times I cook it this way. 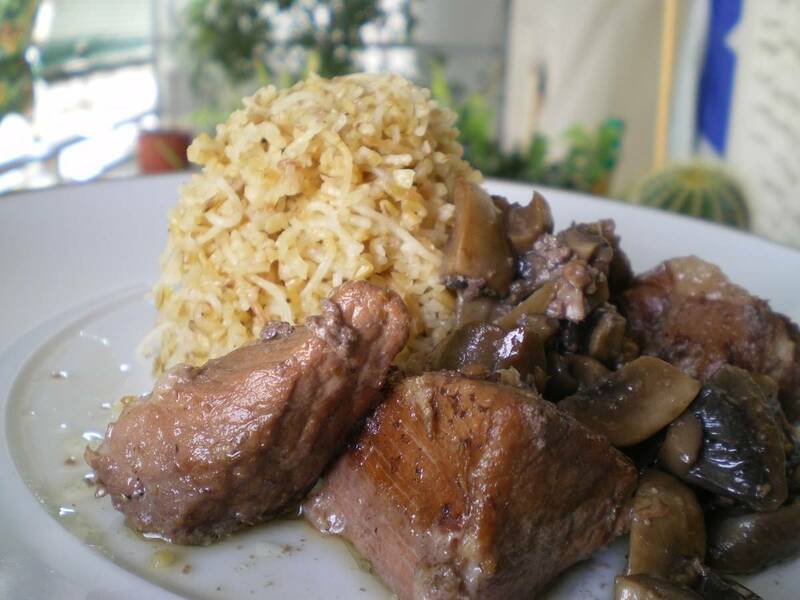 If you want to try it with the pilaf, do not add the leftover meat. Instead of water you may add chicken stock. The traditional way of making this dish was to fry the potatoes in a lot of olive oil and then the meat. Both were then transferred to a saucepan with all the oil and the marinade, water was added and was cooked until the meat and potatoes were soft. I no longer cook it that way but using a sauteing pan, I use less oil which makes it much healthier but reserving it’s original flavour. Afelia is a traditional Cypriot dish of small pieces of fried pork meat cooked in red dry wine and coriander. It is usually accompanied by bulgur pilaf or "patates antinachtes". Marinate the meat with the wine, pepper, cumin and bay leaves and leave them overnight or at least three hours before cooking. Drain and reserve the marinade. Heat the olive oil in a sautéing pan and sauté the meat on both sides. Add the marinade, mix for a few minutes and add the water a well as the salt. Discard the bay leaves ten minutes after cooking. Cover sautéing pan with lid. Bring to a boil and then lower heat and simmer for about 1 hour 15 minutes or until the meat is tender, adding more water, if necessary. In the meantime in a non-stick frying pan heat the 1 tbsp olive oil and sauté the mushrooms for 3 – 4 minutes, season with salt and pepper and set aside. When the meat is cooked, mix in the mushrooms and cook for 2 more minutes. You can find many Greek recipes in my cookbooks «More Than A Greek Salad». Ahhh, I can see why your family loves this dish…that marinade would do the trick. Also, I can see (as my mom told me) that Cypriot cuisine uses a lot of Coriander and the seeds. Yes we do use the coriander seeds and well as the fresh in our salads, eliopita etc., and I love it. That’s an alternative way to cook pork and it seems very easy…. Instead of coriander seeds can we also use fresh corriander? Interesting question. Actually I don’t know but I think it will turn out to be something else. Unfortunately I do not find fresh coriander in Greece to try it. So, I will stick to the crushed coriander seeds.